"In his most recent speech Velupillai Pirapaharan, leader of the Liberation Tigers of Tamil Eelam, alleged that the Sinhalese nation was trying to eliminate the Tamil nation. This is an argument of the same genre as the crude logic that alleges that all Tamils are LTTE. Both are formulas to justify the targeting of civilians." Sri Lanka's Supreme Court has ordered the dismantling of permanent security checkpoints to facilitate the movement of traffic on public roads, suddenly changing the landscape of Colombo. The abandoned checkpoints at various entry points to the city have a desolate look. In his judgment, Chief Justice Sarath N. Silva said that waging war against the state is the severest of offences, punishable by death, and members of the security forces have full power to maintain public order and to take action against those who are waging war or committing related offenses. He observed however that when action is directed against persons who are not thus engaged in war or committing related offenses, every precaution and safeguard must be taken to minimize the resultant hardships. In a time of escalating war, this decision is likely to cause a lot of heartburn. Despite the mass arrests of Tamils, stricter controls at checkpoints and night visits by military personnel to Colombo households, the security situation has been continuously deteriorating rather than improving. The question the government and the Sri Lankan people must now confront is whether attacks on civilians will be halted by a reliance only on increased security measures, even if more skillfully implemented than at present. There is also a need to deal with the issue of security through political means. Unfortunately, due to the unwillingness of both the government and opposition to critically address the issue of national security through political means, there has been an abdication of decision-making to the defense authorities, which the judiciary has been compelled to deal with in order to uphold the human rights and democratic freedoms of the citizenry. But there is a constitutional limit beyond which the judiciary cannot be expected to go in remaking the political framework, which is the responsibility of the elected political leadership. The worst feature of the present phase of conflict in Sri Lanka is the manner in which civilians have had to suffer. Civilians have been targeted by bombs left in public places, claymore mines that target public buses, air bombings that destroy civilian infrastructure and deliberate shootings. Civilians have been used as human shields and been forced out of their homes in large numbers to facilitate military operations. In his most recent speech Velupillai Pirapaharan, leader of the Liberation Tigers of Tamil Eelam, alleged that the Sinhalese nation was trying to eliminate the Tamil nation. This is an argument of the same genre as the crude logic that alleges that all Tamils are LTTE. Both are formulas to justify the targeting of civilians. 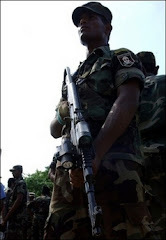 Periodically there have been suggestions that Sri Lanka is heading toward increased militarization and military rule as a result of the government's seeming determination to engage in all-out war against the LTTE. But any such impression has been dispelled by the acquiescence of the defense authorities in the Supreme Court's decision. This was not the first instance of such acquiescence either. In February 2002 when the government signed the Ceasefire Agreement with the LTTE, a similar order to dismantle security checks and barriers went out to the security forces from the government headed by Prime Minister Ranil Wickremesinghe. Just as they deferred to the prime minister's decision to remove the checkpoints in 2002, the defense authorities have deferred to the judiciary today. Once again the resilience of the institutions of democracy in Sri Lanka has made itself felt with the latest Supreme Court decision. Unfortunately, the weakness of democracy in Sri Lanka at the present time is that there is little or no political leadership for the large section of people who wish for a political solution to the ethnic conflict on a humanitarian and just basis. In the past two years, since the advent of the present government, it has been left to the Supreme Court to take bold decisions that are mindful of the basic human rights of the Tamil people. In June this year, when it seemed that an unstoppable security juggernaut had started to evict Tamil people who were temporary residents in Colombo, the Supreme Court stepped in to stop that mass violation of human rights. The problem is that the main political parties are not playing their due role with regard to educating the people and standing up for the rights of the Tamil people in particular. In these bleak days, the main burden of providing a voice to the people's aspirations for justice, fair play and inter-ethnic harmony has fallen upon civil society organizations. Members of civil society groups are generally best equipped to present alternative views at seminars, build networks of like-minded groups, and advocate through email and media campaigns. Despite their limited capacities they have kept alive the notion that there is indeed an alternative way of governance and conflict resolution, and that the people will give their backing to such leadership. But in the final analysis it is the political leadership, with macroscale decision-making power, that must shift the parameters of society and take us to a better future.